If you have a German Shepherd or another large breed dog, a leash is an absolutely critical investment. A leash is one of the most important pieces of equipment you need for your dog, second to a proper harness. The purpose of the leash is to keep him tethered to you for safety and control. In most countries and public places, keeping your dog on a leash is a legal requirement. Even though some dogs are extremely obedient and would not run away from their handler or attack another dog, keeping your dog on a leash is not only a safety precaution but also an act of a proper handler and common courtesy. 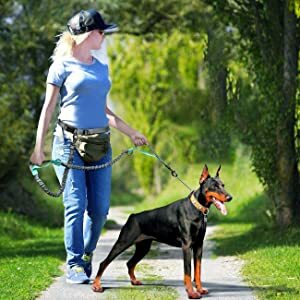 Not only does a leash follow common leash laws, but it also gives you greater control of your German Shepherd or large dog if he pulls hard, if you run with your dog, or if you need a simple leash for walking with your dog. There are many different types of leashes for each activity. 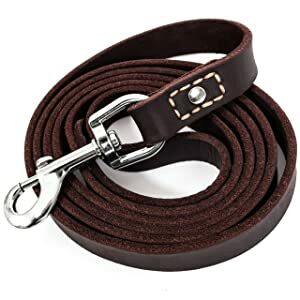 Having the proper type of leash, made of the proper material, with the proper features will give you and your dog the greatest comfort and handling. In this article, you will learn about the different types of leashes, the different materials available, and the different features you may find. Then we will recommend our 10 favorite leashes for various purposes. We hope you find the best leash for your dog! Different types of dogs require different types of leashes. Additionally, different activities require different leashes for the same dog. In this section, we will review six different types of leashes that are best for German Shepherds and for what activity they are best. Typically, a basic standard leash is made of nylon or leather. Both materials are sturdy and durable enough to control a large dog’s powerful strength. Leashes made of nylon and leather are engineered soft enough so that your hands will not get sore or blistered during use. With only one handle, a basic standard leash is best for a dog who does not pull hard on the leash. A dog who obeys the “heel” command or naturally walks slowly is best for a single-handled leash. A basic standard leash is often best for casual walks where your dog will be right beside you. Whether you’re walking on a road, sidewalk, or various public places, you want your dog to be close to you for his own safety. If an unleashed dog approaches your dog, you want to be able to keep him under control, protect your dog, and remove him from the situation if necessary. A simple, 6-foot, single-handled leash will work great in this situation. Similar to the basic standard leash, the double-handled leash is also typically made of soft nylon that is durable, yet comfortable. The difference from the basic standard leash is the addition of a second handle approximately 18 inches from the clip. This second handle allows you better control over a strong dog who pulls hard on the leash as well as better control of any dog in varying situations. Use the long leash for casual walks, loose leash walking, and extended sniffing. Use the shorter leash for busy sidewalks, bike paths, and crowded areas that require you to have instant, close control of your dog. This second control point gives you (the dog’s master) dominance over the situation. A hands-free dog leash commonly possesses a certain set of features. First, you’ll notice the waist belt that features an adjustable band and a buckle. Sometimes the belt has a pouch for storing a phone, wallet, keys, treats, doodie bags, or other essentials. 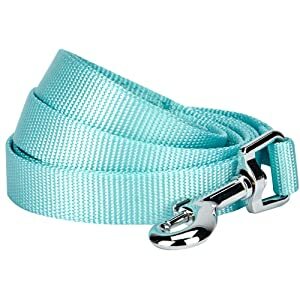 The leash portion clips onto the belt and features two handles and elastic. The elastic portion lets your dog move around as he wishes. The two handles let you take control of your dog if the situation arises. And the waist belt leaves your hands free while keeping your dog close to you. Hands-free leashes are often made of soft nylon, so the waist belt does not become abrasive. The handles feature soft fabric, so you do not blister your hands when you take hold. The elastic is durable and absorbs shock if your dog suddenly changes direction. The most common activities for a hands-free leash include running, hiking, and bicycling. In these activities, you and your dog need to be able to move independently from each other. The elastic leash allows such movement. If you’re riding a bicycle and your dog moves away from you, a standard leash would pull you off your bike. The elastic of the hands-free leash allows your dog to move around without the risk of making you fall off your bike. Additionally, the waist belt keeps you tethered to your dog while your hands are occupied on the handlebars. Hiking is a similar scenario to bicycling. As you navigate the trails, rocks, and tree branches, you want your dog to be able to do the same. The elastic leash does just that. Additionally, the waistband keeps you tethered to your dog while keeping your hands free. You have the additional freedom to grasp tree branches for stability, hold a trail map, or drink from a water bottle. Retractable leashes give you the control to let your dog wander as far away from you as you want. This type of leash often extends up to 16 feet. Your dog can explore his surroundings as you walk, run, or hike. If the need arises, however, retractable leashes have a brake system that stops your dog from roaming further away from you. Retractable leashes do have their restrictions, though. They are not designed for powerful large-breed dogs who pull hard on the leash. The leash is often thin and narrow. It is not meant to handle so much brute force. A retractable leash is better suited for a gentle walking dog or a smaller dog (under 50 pounds). The best activities for a retractable leash include walking, running, and hiking. Your dog may want to explore his surroundings during these activities. Having 16 feet of freedom will make him happy. And you can use the brake system to keep him close by if the need arises. For example, if you’re walking in a public park and another dog walks by, you’ll want to keep your dog close to avoid conflict and be courteous. Training leashes are extremely lengthy so that your dog can practice commands and tricks without requiring the handler to run right beside him at all times. Training leashes are fairly simple in design. They’re made of nylon with a single handle and a clip. You can find training leashes in many different lengths: 15, 20, 30, or even 50 feet. Training leashes are often first used with puppies to teach them the recall using the Come command. Hook the training leash onto your pup’s collar and let him wander away a bit. Call him back with the Come command. Training him this way teaches him to come when called, despite any distance or distraction between you and the pup. Once a pup is older, you can continue to use the training leash to teach him agility tricks, tracking skills, and other activities. You could let your dog go swimming in a lake without worrying about him running away with the use of a training leash. At 30 or 50 feet in length, your dog can swim around, have fun, and get exercise while you monitor the leash length. Multiple-dog leashes feature a couple different styles. You can purchase a leash that accommodates 2 dogs or 3 dogs. 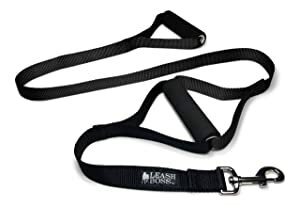 You can purchase a full leash (as pictured above) with a 6-foot leash and 2 or 3 connection points. Or you can purchase an adapter (also pictured above) that simply connects to whatever type of leash you already possess. The adapter might be a great option for most people because you do not have to buy an entirely new leash. If you like the leash you have, just connect the adapter and you’re good to go! This adapter is compatible with most leash types. Standard, double-handled, retractable, and hands-free all work well. A training leash might not be ideal, though. Allowing multiple dogs to wander 20 feet or more away from you could be difficult to manage if they would start to run away. A multiple-dog leash is great for walking all your dogs at once without wrapping 2 or more leashes around your wrists. If your dogs get along well, they will love walking while tethered together. If your dogs need some practice with getting along, a multiple-dog leash could teach them to cooperate while walking. With an adapter, you could use a multiple-dog leash for running, hiking, and biking as well. For these activities, a hands-free leash with an adapter would be most compatible. Now you know the different types of leashes on the market. Next, you need to know what criteria to look for in a high-quality leash. Following is a list of criteria and features that will tell you if your leash is durable and well-made. Durable nylon or leather to withstand pulling, abrasion, and normal wear-and-tear. Soft, lined handles to avoid abrasion and blistering of the hands. Many leash handles are lined with fleece or neoprene. Reflective detailing to give your dog higher visibility and more safety in low-light or nighttime situations. Waterproof coating to avoid faster wear-and-tear over years of use. Constant wet-then-dry transitions can cause faster breakdown of materials. 4 or 6 feet in length for standard or double-handle leashes. Shorter than 4 feet will not allow your dog enough freedom while walking. Longer than 6 feet can get cumbersome if you’re walking with reduced space. The Pet Lovers Club Dog Leash is a 6-foot basic standard leash designed with 2 layers of nylon for large breeds who like to pull hard while walking. Leather entices dogs to chew and metal chains can hurt dogs, so this nylon leash is ideal! No leash is 100% chew proof, but the double layer nylon of the Pet Lovers Club leash makes it three times harder to chew through! The cushioned handle prevents friction burns on your hands so you can focus on your activity. The nylon contains a weather-proof coating so normal wear-and-tear doesn’t wear out your leash too fast. And the mental D-ring at the handle provides a convenient place to store waste removal bags. We love this leash for its simplicity, durability, and safety. For someone with an easy walking German Shepherd or large breed dog, the single handle design is ideal. The 6-foot length allows perfect room for your dog to meander while you walk without getting too far away. The reflective detailing keeps your dog safe at night. And the durable double-layer nylon with a weather-proof coating will make this leash last for years! 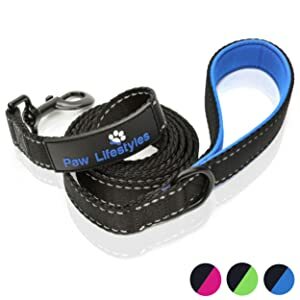 The Paw Lifestyles Dog Leash is a basic standard leash that measures 3mm thick (2x thicker than your average leash) and is made of tightly webbed nylon for extreme durability. The single handle features premium neoprene padding for all-day comfort on long walks. The entire length of the leash is detailed with 2 seams of luminous reflective threading to keep you and your dog safe on low-light evening walks. The heavy-duty nylon is weather-resistant coated to prevent wear-and-tear over years of use. The 2” heavy-duty clip will keep your dog safely tethered to you at all times while the metal D-ring works great for attaching waste bad dispensers to clicker training mechanisms. Attach this leash to your existing collar or harness and you’re good to go for walking, running, hiking, and more. We chose this basic standard leash for its durable design, sleek appearance, and simple construction. There’s nothing unnecessary about it. The neoprene keeps you comfortable while the woven nylon and metal clip keep your dog tethered and safe. That’s all you need in a high-quality leash! The Primal Pet Gear is a double-handled leash, 6 feet in length and features 2 padded handles. The leash is made of soft, heavy-duty tightly-woven nylon with high-grade neoprene lining in the handles. The clip is made of new and improved heavy-duty rust-resistant zinc alloy. The long leash handle features a metal D-ring for a waste bag holder. And it’s available in 9 fun colors to match your dog’s personality! We love this leash for all of its features and high-quality engineering. Walking your German Shepherd or other large breed dog will be comfortable and in control. The versatile handles let you control your dog in almost any situation. Meanwhile, the soft nylon and high-grade neoprene give you the comfort you need to partake in longer walks and activities. The Max and Neo Dog Leash is available in 4-foot and 6-foot lengths and 7 different fun color options. The double neoprene-lined handles prevent redness, chafing, or blistering on your hands. 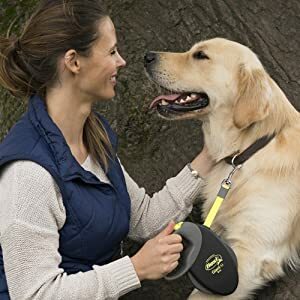 The 6-foot leash can be used like a normal leash with the end handle, but also like a short leash with the lower handle 10.5 inches above the gunmetal finish bolt snap collar clasp. The upper clasp also features a metal D-ring so you can attach waste bag holders. The entire leash is stitched on both sides with reflective 2mm-wide stitching to increase your dog’s visibility in low-light conditions and increase your safety. And if you buy a Max and Neo product, the company donates the same product to a dog rescue in need of supplies! You’re not only buying a great piece of equipment for your own pooch, but you’re also helping a dog rescue organization who needs supplies to help lovable dogs! We love the Max and Neo leash for all the reasons above! Not only is it a well-made piece of equipment, the company helps other dogs gain a better life! The Leashboss is a super heavy-duty double-handle dog leash for large or extra large dogs. Does your dog weigh 80 pounds or more and pulls hard while walking? This might be the leash for you! The padded tubular handles give you ample grip strength without leash burn. The non-bending traffic handle is 18 inches from the clip to keep your dog close in small spaces. Hold both handles for the most control or hold the long handle for more freedom. The 5-foot length gives just enough space for your dog to roam. 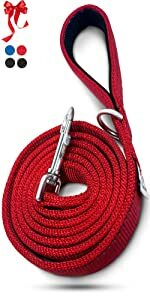 This made-in-the-USA leash is engineered with high-quality durable nylon. And upon purchase of the leash, you automatically receive a 5-year “Leash Boss” warranty that will replace the product if you are unhappy with it or if it gets damaged. We chose this Leashboss product because it’s made for dog owners blessed with an extra-large pup. If you have a super strong dog who pulls hard when he walks, you know you need the cushioned handles and heavy duty build. The Leashboss is a step up from your average double-handled leash! The tobeDRI is another heavy-duty double-handled leash for extra large dogs who pull their handlers around when they walk. The non-bending foam handle prevents leash burn while the neoprene-lined traffic handle keeps your dog under control without causing you discomfort. The double layer of nylon is thicker than standard leashes and prevents your dog from breaking free. Reflective stitching on the entire length of the 6-foot leash gives you added safety in low-light conditions. And the 18-month warranty promises a 100% money back guarantee if you are unsatisfied! We chose the tobeDRI as another option for owners of extra-large dogs. It doesn’t have a second non-bending foam handle but provides the same level of control. Your hands won’t get sore from leash burn and your dog won’t take you for a walk! 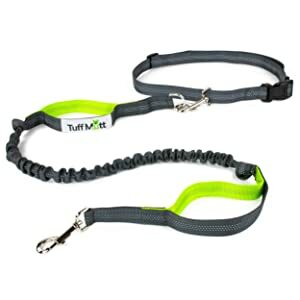 The Tuff Mutt Hands-Free Dog Leash gives you the easy and natural way to run, walk, or hike with your dog. The waist belt is adjustable to fit you perfectly while the metal clip moves about freely. The Dual Handle Control gives you the flexibility of having a regular leash and the control of having a short leash in tight situations. The shock-absorbing bungee allows your dog to have his space but removes the risk of injury if he were to lunge away from you. The reflective stitching keeps you and your dog safe in low-light evening activities. We love this hands-free leash for its versatility in activities. You could take a walk with your baby stroller or job through a park. Avid runners reduce shoulder pain and gain a natural running stance without having to grasp a leash. Neighborhood walkers keep their dog close with a 48” leash or even closer with the Dual Handle Control system. This Tuff Mutt Leash is an overall winner in this category! The Flexi Giant Tape Leash is a 26-foot retractable leash that is ideal for active, adventurous large dogs. Your hand won’t be tired after a walk with the ergonomic handle design, single-handed brake system, and permanent stop feature. The neon belt isn’t reflective but the bright color provides increased visibility in low-light evening or nighttime conditions. A retractable leash such as the Flexi Giant is great for walking on the beach where your dog may want to swim but you don’t. You can take your dog on a leisurely walk and let him roam about and sniff everything interesting. You can run with your dog and let him run close to you or let him have his space with the easy glide retractable mechanism. No matter what, the 26 feet of leash will give you and your dog freedom to explore! The Pet Dreamland is both a hands-free leash as well as a multiple-dog leash. It features 4 bungees to prevent you and your dogs from shoulder pain, back injuries, wrist injuries, and neck strain. The swivel splitter allows freedom of movement and prevents tangling. The waist belt is adjustable from 27” to 48” to fit you perfectly and features 2 D-rings for attaching waste bag dispensers or treat pouches. The extender adjusts from 43” to 55” simply by untying the 3 knots. Each segment of the dog coupler is 16” to 20” in length. The entire leash is designed for 2 big dogs up to 150 pounds each. 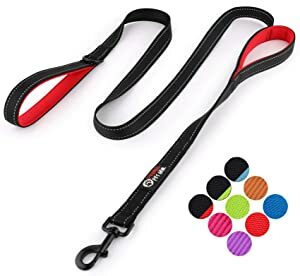 3 handles on the leash are lined with neoprene so you can keep your dogs close in tight situations without blistering your hands on rough nylon. We chose the Pet Dreamland leash for its versatility as a hands-free leash and a multiple-dog leash. Its plethora of features makes this one of the best leashes on the market for walking, running, or hiking with your dogs. It’s definitely built for German Shepherds and large breed dogs! You won’t have to wrap multiple leashes around your wrists if you walk with the Pet Dreamland leash! The Blueberry Pet Dog Leash is a simple yet high-quality 5-foot basic standard leash available in 19 trendy colors to fit your dog’s personality! 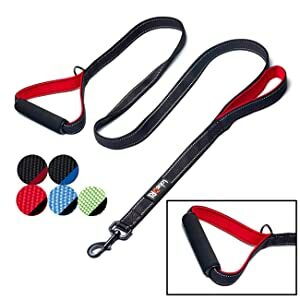 This leash is made of high-density woven nylon for strength and durability. The fabric is machine washable in cold water on the gentle cycle with similar colors. The large-sized leash can withstand a dog up to 90 pounds. And if you love this leash as much as we do, you can buy the matching collar and harness to go with it! We love the simple elegance of the Blueberry Pet Leashes. They’re made of durable nylon that can withstand normal wear-and-tear, although nothing is 100% chew-proof when it comes to puppies. The only downside to this leash is the lack of padding in the handle (no neoprene or fleece) so we recommend this leash for a gentle walker who doesn’t pull hard on the leash. We hope you found a leash suitable to your German Shepherd or large breed dog! We do our best to give advice so feel free to leave a comment or ask a question!